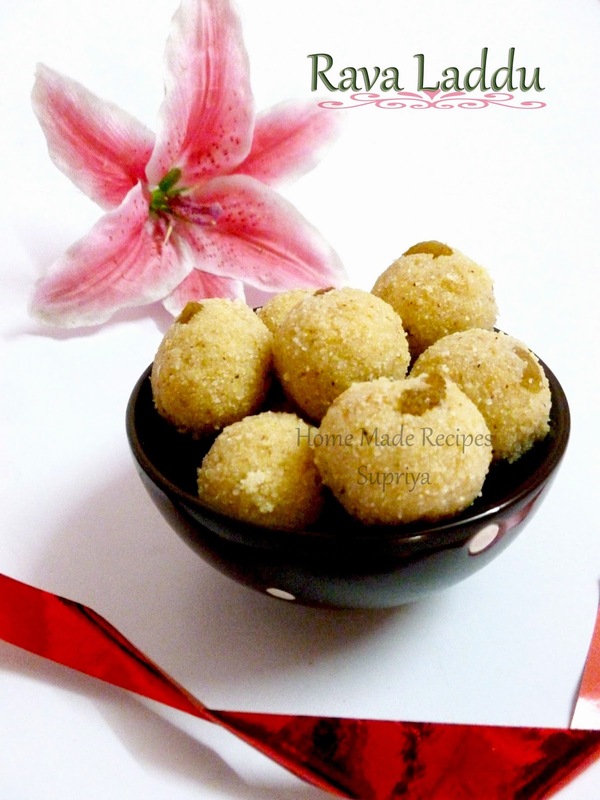 Rava Laddu/ Ladoo is one of my favourite Diwali sweets. Its very easy to make with very less ingredients too. I learnt this from my grandma, just few months back, after my post pregnancy as I have a sweet tooth. I just love the way she does sweets and snacks for festivals. I insisted my mom to prepare again this time for this Diwali which she did and after sharing it with her neighbours and friends, only a few were left out for us. So, I told mom, I will prepare this again the next day all by myself, and I am happy I did it and made about 45 ladoo's. Hurray! 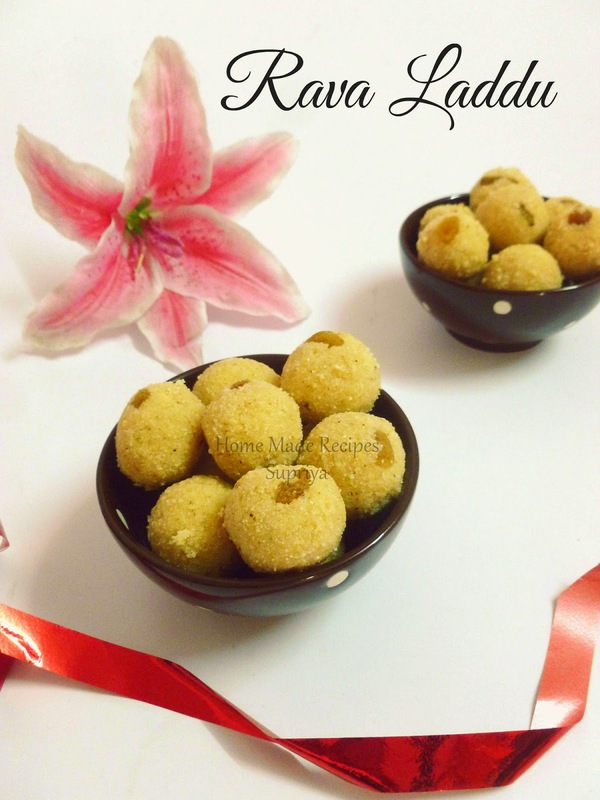 Now if you are running out of time, for some festival preparations, you can always opt for this easy and quick laddu's and everyone will just love it. I like the way my grandma prepares this Rava Laddu. She makes it with sugar syrup and that's the way I like it instead of using the powdered sugar and mixing it with roasted rava/Semolina. 1. Roast Rava/Semolina on a low to medium flame with ghee in a wide pan or kadai. Be careful not to burn it or change colour. 2. Meanwhile, prepare the sugar syrup- Add 2 cups of sugar and little water appx - 1/4 cup. Heat it and switch of the flame when you get a one string consistency. Add elachi powder and a pinch of salt and keep aside. 3. Add roasted rava and raisins( not roasted) to this sugar syrup and mix well. Cover it with a lid and leave it aside for 10-15 mins. 4. Roast some freshly grated coconut in the same kadai with some ghee and add it to the rava-sugar mixture. 4. 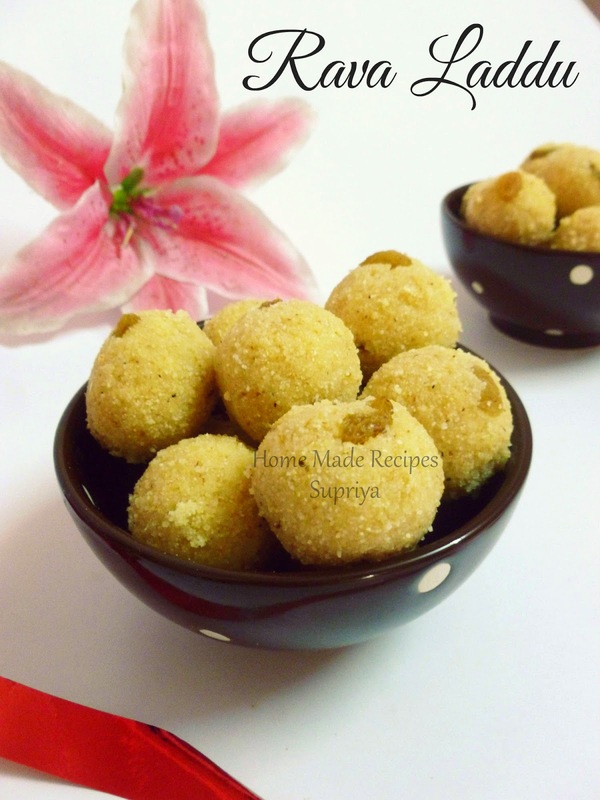 Take a portion and make ladoo's out of them. If you find the mixture is too dry you can add 1 or 2 tbsps of boiled warm milk to it and mix. Store it in an air-tight container for 5-6 days. If you add milk, you will have to finish it off much earlier. Note: Adding coconut is again optional. Add roasted cashewnuts if you like them.